CORNELIUS BROWN was born at Lowdham, Nottinghamshire, on March 5th, 1852. He chose the profession of journalism, and early in life entered the office of The Nottingham Daily Guardian. Here he came under the influence of men well known in the world of letters, and in daily contact with such literary mentors and friends, he possessed undoubted advantages, which his studious and observant nature enabled him to turn to good account. Antiquarian and historical subjects possessed an attraction for him, and he started in the Guardian a column of "Notes and Queries," which he subsequently edited under the happy alliterative title, "Notes about Notts." In 1874 Mr. Brown was appointed Editor of The Newark Advertiser, which he conducted up to the time of his death with marked ability and erudition. Of his literary work, besides special articles contributed to various journals, the following were issued in book form "Notes about Notts." (1874), "The Annals of Newark" (1879), "The Worthies of Notts." (1882), "An Appreciative Life of the Earl of Beaconsfield," "True Stories of the Reign of Queen Victoria" (1886), "A History of Nottinghamshire" (1891), and "A History of Newark" in two volumes (1905 and 1907). This last self-imposed task occupied all his spare time and energy for fifteen long years, and in his own words: "Newark is worthy of the book, and if the book prove worthy of the town, my ambition and reward are alike realised." CORNELIUS BROWN was a Fellow of the Society of Antiquaries, also a Vice-President of the Thoroton Society of Nottinghamshire. His knowledge, antiquarian and historical, was profound; his memory vast and exact; his judgment strong and acute; and he united with all his gifts a most amiable and cheerful temper, which made him beloved of all who knew him. 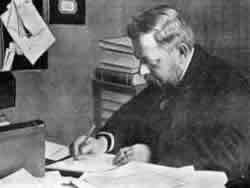 On October 31st, 1907, he corrected the last proof [of volume 2 of his History of Newark] for the printer, and almost as he laid down his pen, illness seized him; four days later, on November 4th, his spirit passed to the land of shadows; "his work was done; how well he had done it."